South Africa is continuing its mission to strengthen ties with the north east African country of Eritrea, the international relations department said on Tuesday. 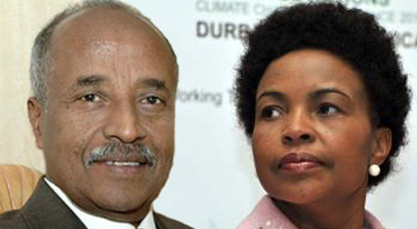 This was underlined in a meeting between International Relations Minister Maite Nkoana-Mashabane and her Eritrean counterpart Osman Salih Mohammed in Cape Town, it said. “Minister Osman has indicated to me that Eritrea is open for business with South Africa, especially in the sectors of mining, railway and tourism infrastructure, agro-processing, agriculture, fisheries and solar energy,” Nkoana-Mashabane said. The two countries should soon be in a position to enter into a general co-operation agreement, which would lay the foundation for exchanges in all spheres.